It was a hot day in Jamdown yesterday! Scratch that. It’s been a hot summer here in JA. And if a Jamaican tell you seh it hot . . . di place a bun up! 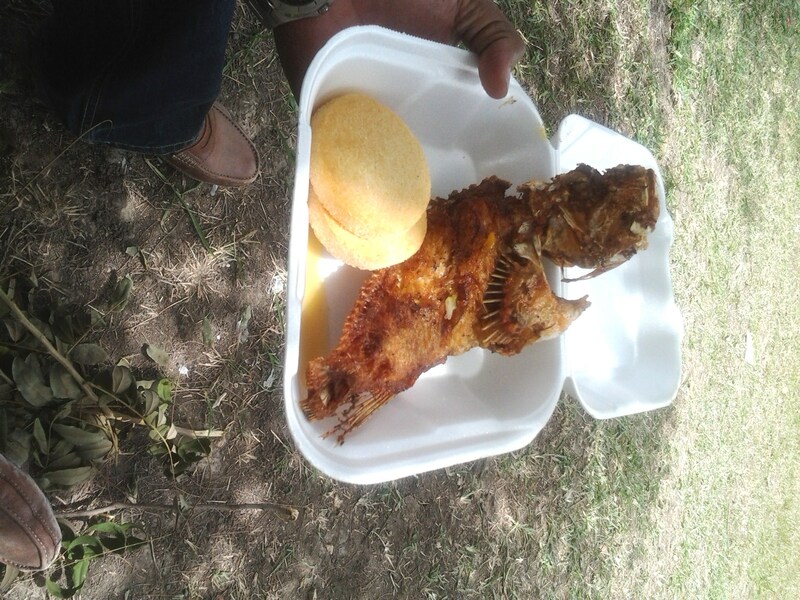 So yesterday, my infamous other half and I took a trek down to May Pen to take in the sights and sounds of Denbigh 2013. Denbigh is an annual agricultural and industrial fair showcasing our current and modern trends in agriculture and the food industry. Denbigh celebrated its 61st anniversary this year with a three-day exhibition from Aug. 4-6, right in line with our Independence celebrations. We made an extra effort in going this year since the event was in its 61st year, and neither of us had ever been. So we braved the blazing heat and took to the road for this, our first excursion to Denbigh. The drive was exceptionally shorter than expected; a mere 45-minute drive from Kingston and we were there. Now when I mentioned that it was hot, I was talking about in Kingston. I didn’t take into consideration the elevation and longitude and latitude and all those tings that make May Pen even worse. In other words: no amount of A/C, shady tree, nor shorts an a hat coulda stem da heat deh! Thank God for sunblock (and yes, I did douse myself in sunblock ’cause I burn easily)! Anywho . . . so there we were at Denbigh. The place did cork full a people: people setting up their stalls (apparently we were kinda early at 11a.m. ); people selling water and drinks and other things (cause a man’s gotta hustle and a man’s about to drop from heat exhaustion); and people (like us) who came to see what this whole Denbigh thing was all about. Our journey through the Denbigh grounds started at the Clarendon Pavilion, where we were shown how the Irish potato was cultivated from production to consumption. They even created a model of a processing plant illustrating the different stages in the process. 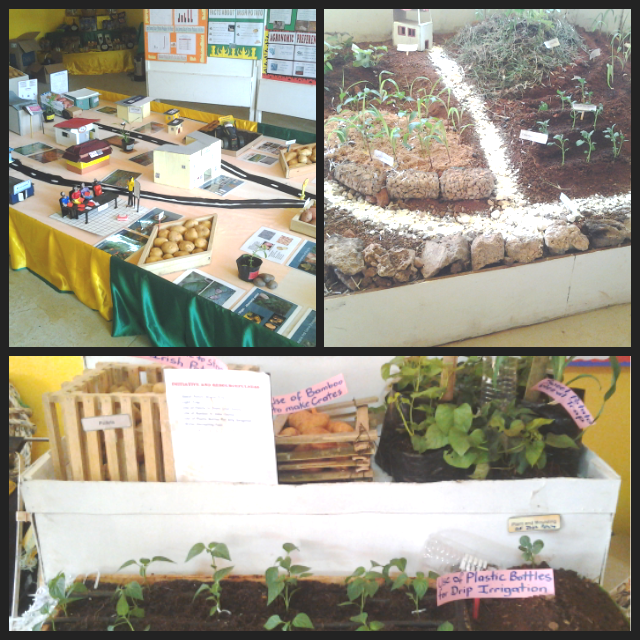 In that booth they also showed the different methods of farming: from contour farming to the use of grass mulch. They also illustrated the use of some everyday materials in farming practices, such as using plastic bottles for drip irrigation and shipping palettes to contain the potatoes. 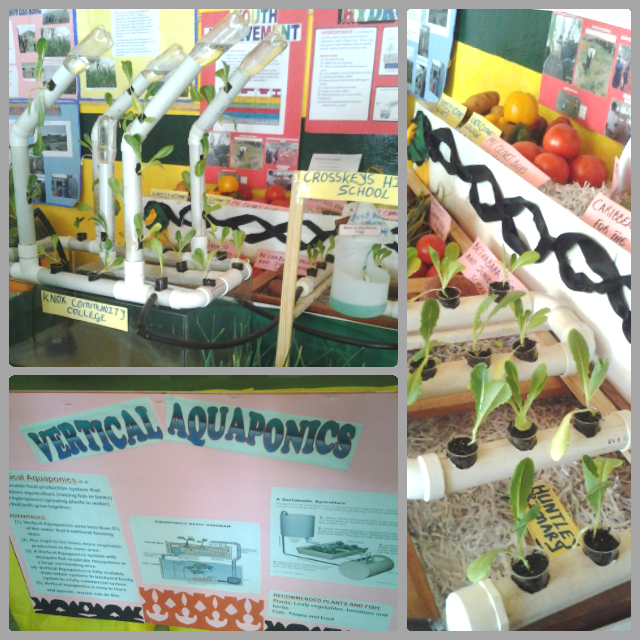 There was an irrigation system illustrated by the Knox Community College called vertical aquaponics. I’m not sure if they created this system, but they did a very impressive demonstration of how the system actually works. 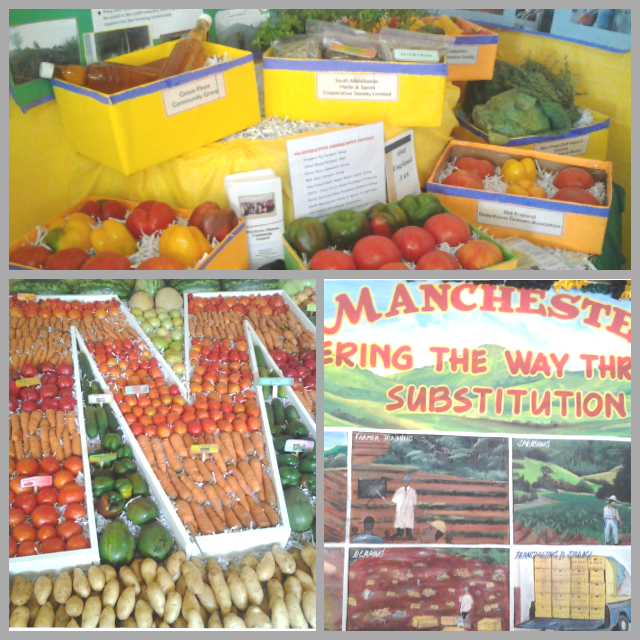 Then there was the beautiful display of our agricultural produce, from plump juicy tomatoes, carrots and red and sweet peppers to the Irish and sweet potatoes, avocados, watermelons, cantaloupes and cucumbers. 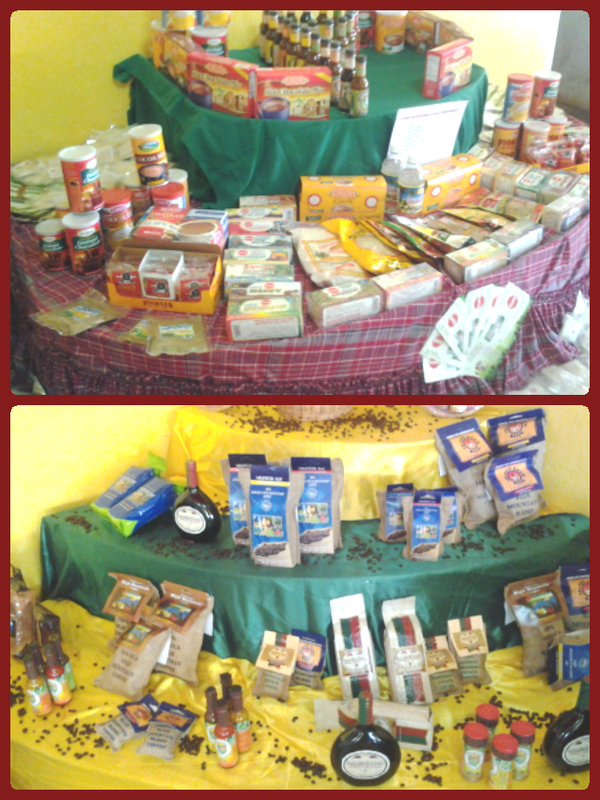 Then, of course, were the Jamaican products, from coffee and spices to our different tea products and coconut milk products. 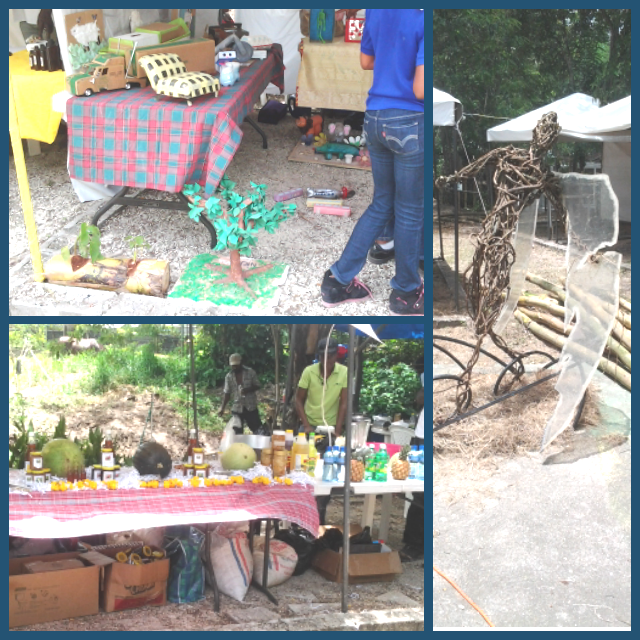 After we left the Clarendon Pavilion, we made our way through several other booths and stalls, one of which displayed a variety of products and artwork made from recyclable material..
Another carried honey-related products, as well as coconut-based products. Then we came upon this man walking along with his shard of glass – no big deal! Afterwards we came across the livestock division, and can I tell you? I felt like a kid in a candy store (I dunno why though). 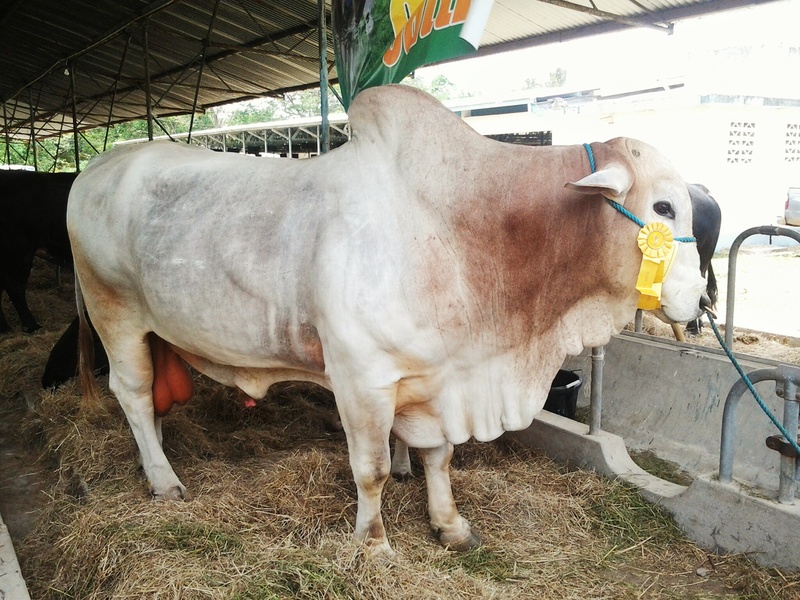 We evaluated the cows and measured the gonads of the bulls. This guy obviously won . . . or came second, at least. 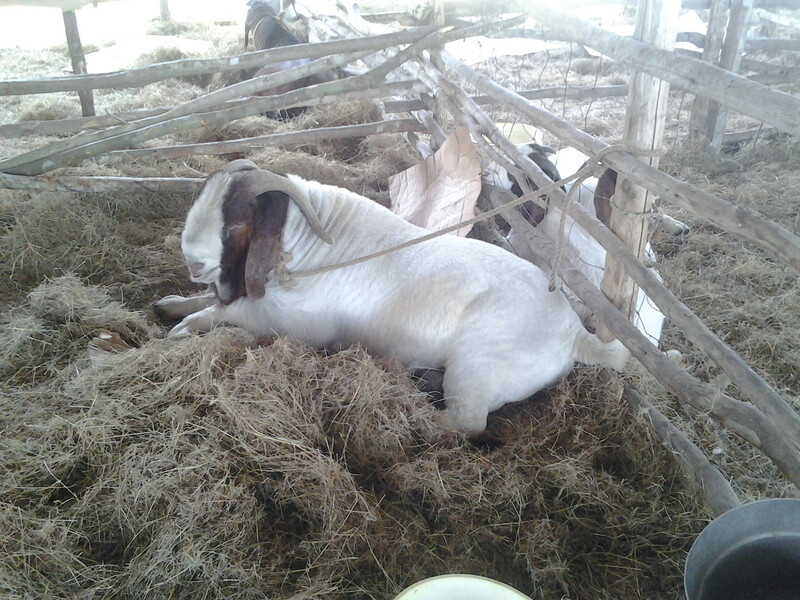 We then moved on to the goats and, well . . . He almost started a fight between two rams, while I tried to guess the age of this here fellow. He looks to be about 65 years, but his handler claims he’s just 3 (not buying that one). 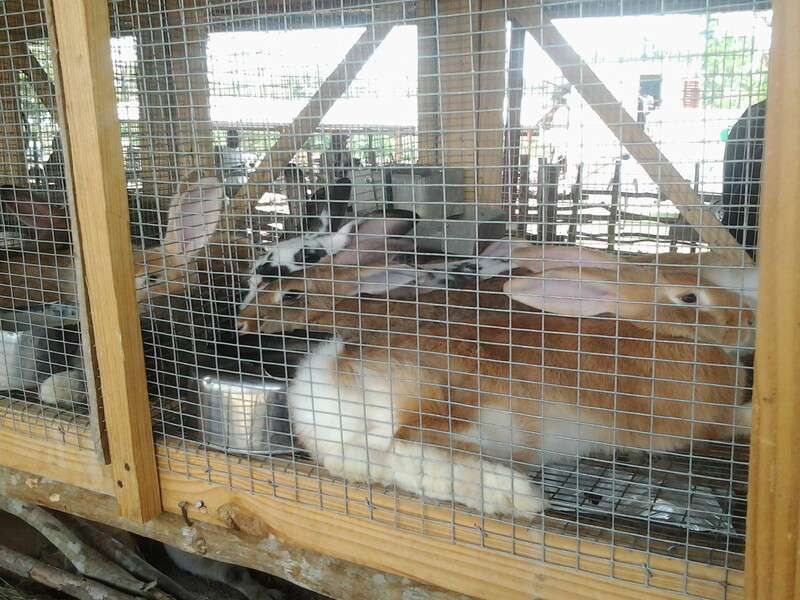 I found Rabbert Kline’s cousin Mr. Hoppit cozying up to a couple other wabbits. 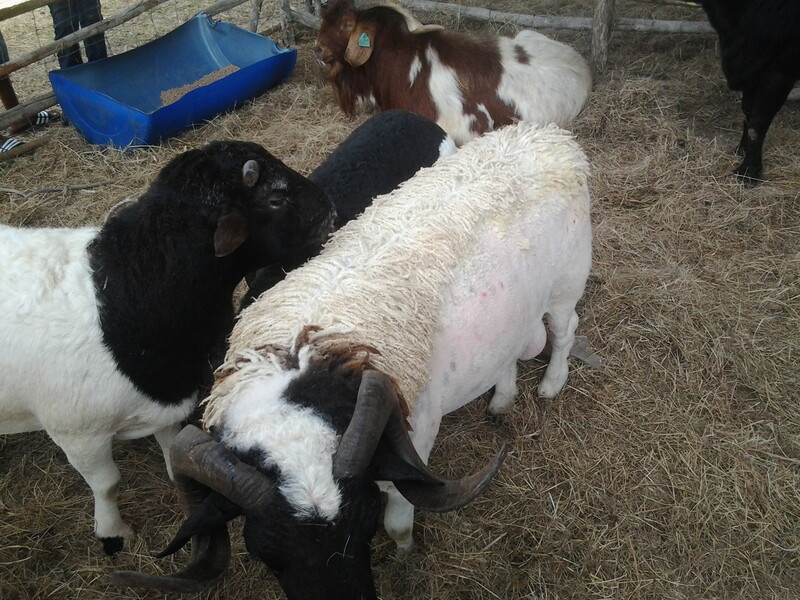 We also found a couple rasta sheep who were killing it in the style division – with horns all curled and his mohawk done up all neat. After the livestock section, we made our way back to the Ebonyvale tent, where he and I got some fruit daiquiri. 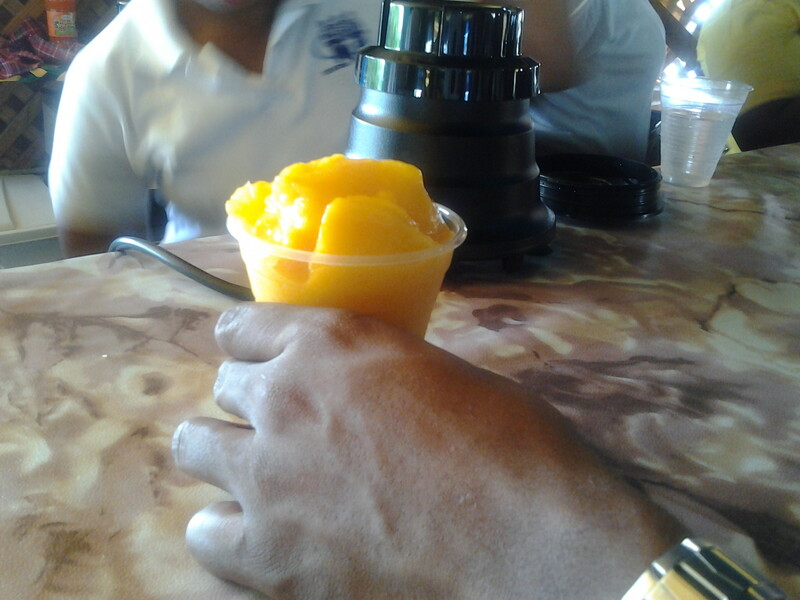 His was made of mango, pineapple and cantaloupe, while mine just had mango and pineapple. Then he braved the infamous lionfish with bammy, and I have to say, for something that’s potentially dangerous, it tastes just like fish – nothing exceptional or interesting. He says it tasted great, but I just thought it would have a . . . dangerous or exotic taste to it, but what do I know?! I had the good ol’ pan chicken with festival. How we got back to Kingston, I cannot say, as I was out like a light once we touched the highway. But . . . it was a great day. A little on the scorching side, but great!